The Zenith boutique on the Rue du Rhône was broken into last night between 5 and 6 am. Initial observations indicate that the burglars smashed through the front door using a ram-raid vehicle, before making off with the contents of the Boutique’s inside displays. The information gathered onsite by police does not as yet enable them to provide any further details on the event as such, nor on the estimated value of the goods stolen. An investigation is in progress and every effort is being made to render the Zenith Boutique operational again as soon as possible. The Boutique will therefore as planned be hosting its guests on August 29th for the traditional Geneva grape harvest celebrations. Founded in Le Locle in 1865 by a visionary watchmaker, Georges Favre-Jacot, the Manufacture Zenith earned swift recognition for the precision of its chronometers with which it has won 2,333 chronometry prizes in a century and a half of existence: an absolute record in terms of pocket watches, onboard timers and wristwatches. Having earned fame thanks to its legendary El Primero calibre – an integrated automatic column-wheel chronograph movement launched in 1969 and endowed with a high frequency of 36,000 vibrations per hour that ensures measurements accurate to the nearest 1/10th of a second – the Manufacture Zenith has since developed over 600 movement variations. 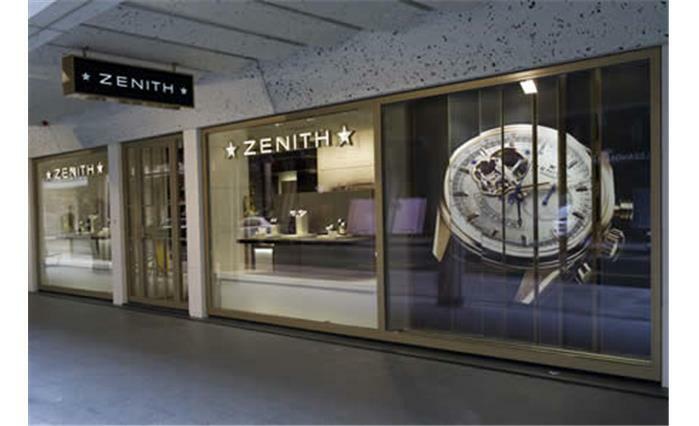 All Zenith watches are fitted with an in-house Zenith movement and are developed by the Manufacture in Le Locle. The latter currently stands at the exact spot where its founder built the first company workshop, thus physically embodying a continuity that is a rarity in itself.